Introduction to Nature-Inspired Optimization brings together many of the innovative mathematical methods for non-linear optimization that have their origins in the way various species behave in order to optimize their chances of survival. The book describes each method, examines their strengths and weaknesses, and where appropriate, provides the MATLAB code to give practical insight into the detailed structure of these methods and how they work. Nature-inspired algorithms emulate processes that are found in the natural world, spurring interest for optimization. 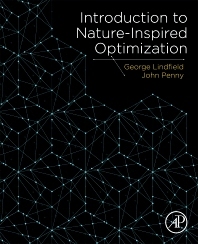 Lindfield/Penny provide concise coverage to all the major algorithms, including genetic algorithms, artificial bee colony algorithms, ant colony optimization and the cuckoo search algorithm, among others. This book provides a quick reference to practicing engineers, researchers and graduate students who work in the field of optimization. "Besides being very useful to those who are interested in discrete optimizations problems and applying various nature-inspired metaheuristics to them, the involved reader can also benefit from comparative studies of algorithms highlighting their strengths and weaknesses.